Boulder, CO – Race Across the West (RAW) concludes its 11th year with two rookie winners and a team record broken. Twenty six solo racers from seven countries lined up in Oceanside, CA and 70% of those racers completed the 928-mile race ending in Durango, Colorado. Ingo Heeb, a rookie racer from Switzerland, won in 2 days 23 hours 44 minutes (12.94mph). His closest competitors were veteran Gregory Robinson (USA) and Chris Ramsey (USA). The 50-59 age group was won by Dany Bonneville (CAN), a rookie and director of the RAAM Qualifying race, the Bonneville 808. He was followed closely by rookie Gerry Steinberg (GER). Mikael Mikkelsen (DEN) won the 60-69 age group by edging out Charles Combs (USA). Combs has been a crew chief for RAAM on numerous occasions. Also, of note, Tony Musorafite (USA) became only the second person to complete the race on a fixed gear bicycle. The women’s race was a close race throughout, with Anne Moore (USA) beating Christi Patrick (USA) and Dorina Vaccaroni (ITA). 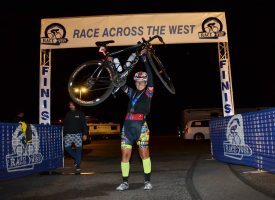 Vaccaroni is known more for being an Olympic fencing medalist than a cyclist, but recently she has been making her mark in ultra-cycling races bringing home wins in several recent RAAM Qualifying races. The 2-person team race was dominated by Laureus Alegra (SUI). RAAM veteran, Marko Baloh (SLO) and his teammate, set a new record by finishing in 2 days 1 hour 52 minutes (18.62 mph). The 4-person team, MOAB Racing to Beat Lewy, crossed the finish line with Laureus Alegra, but fell just shy of their own 4-person record. MOAB edged out veteran 4-person team Team San Diego Sports Medicine/ZOCA (USA) for the win. For 11 years RAW has been running concurrently with RAAM, the ultra-bicycle racing world championship. RAW has become an elite level race in its own right and draws competitors from around the globe to tackle the challenging western third of the RAAM course. Preparations for 2019 are already well underway. RAW takes place every June between the Giro d’ Italia and the Tour de France. About RAAM: RAAM and SOUL EVENTS are world leaders in the sport of ultra-bicycle racing. The team is responsible for the Race Across America (RAAM), the world’s premier ultra-cycling race, a 3,000-mile coast-to-coast race across the USA, as well as the Race Across the West (RAW), a 900-mile race across the Western US, the RAAM Challenge Series, and the 6-12-24 Hour World Time Trial Championships. In addition, they offer seminars on ultra-bicycle racing and sanction ultra-bicycle races worldwide. Visit www.raceacrossamerica.org. Facebook, Instagram (@raceacrossamerica) and Twitter (@RAAMRaces).